Parashat B’shalah 2014/5774 (Triennial II): Why Am I in the Middle? At the end and the beginning of the triennial section of this week’s Torah portion (Exodus 14:15 and Exodus 16:8), Moses finds himself standing between a complaining people and an impatient God. 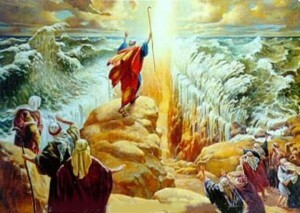 At first, Moses tries to intercede but later on he tries to get out of the way. Why the shift? What is different now about the relationships among God, Moses, and the Israelites that leads Moses to no longer want to be the middle man? And perhaps investigating this question will help us understand what to do when we are caught in the middle. Join us for this interesting conversation on being caught in the middle.